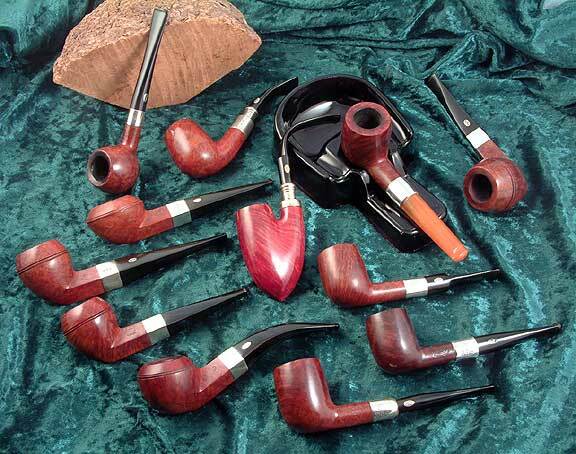 Quite a few years ago, a friend of mine had a little estate pipe business. He'd send out a mailer every couple of months with lots of pictures of beautiful pipes. In one issue, I saw an amazing old straight, tapered bulldog, made by GBD. I'd never paid much attention to GBDs before that, thinking them to be pretty much just cheap pipes. When I saw that pipe, I was instantly captivated by it. The hallmarks dated it to 1929. 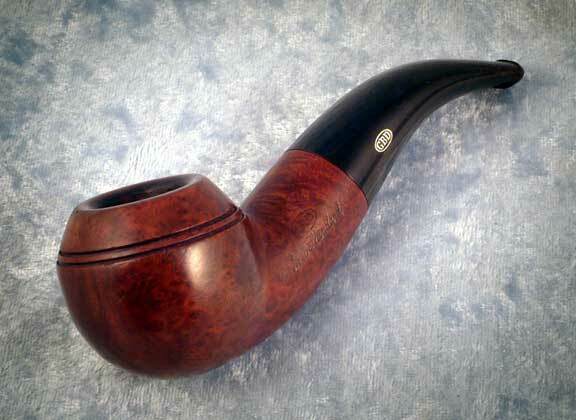 The grain was beautiful, but the most fascinating aspect of the pipe was the cut. I'd seen lots of bulldogs, but this was exceptional. You can see that pipe in the photo below, on the left, just above the bent bulldog. I paid $50 for this pipe - a real bargain, even then, and then once again forgot about the marque. A few years later, my good friend Ziggy showed up at the pipe club with some stellar GBD Virgins sporting perspex stems and silver bands, originally fitted to the pipes by Smoker's Haven. We wheeled, we dealed, we made trades. I came home from the meeting with a prince, a canadian and an apple that wold forever change my thinking about this brand. I went on a tear. I began acquiring every GBD I could get my hands on, to study them, to smoke them, to understand what it was about them that I suddenly found so engaging. 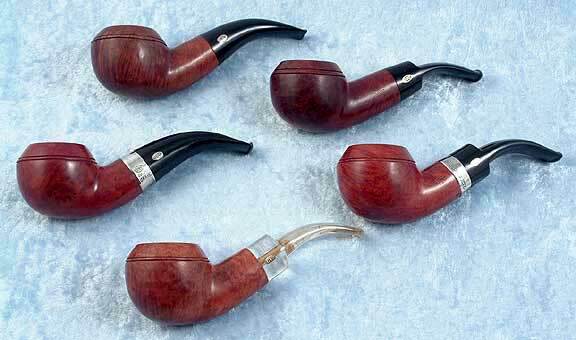 These pipes are cut so beautifully, so elegantly. From the perfect balance of the shapes to the beautifully chamfered bowl rim, there's just something classically elegant about these old pipes. To my eye, they define many of the classic shapes better than even some of the more highly-regarded marques. Since then, many GBDs have come, many have gone. 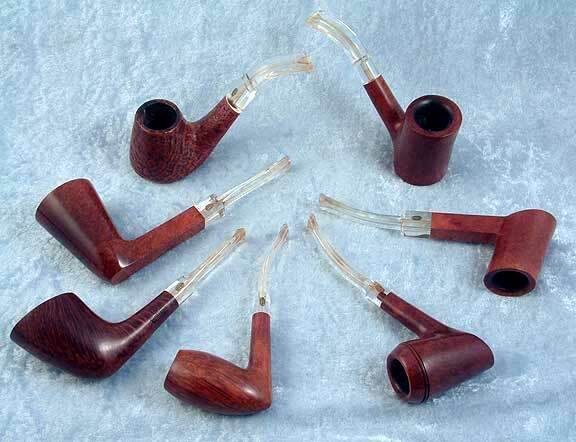 I've tried to select exquisite examples for my colletion - pipes that are exemplary in every regard. Not all old GBDs smoke wonderfully, but when they do, they sing. The French made ones, for some reason, seem particularly suited to Virginias. GBDs are not exactly hip. They're not trendy. They're not the high-grade pipes du jour. 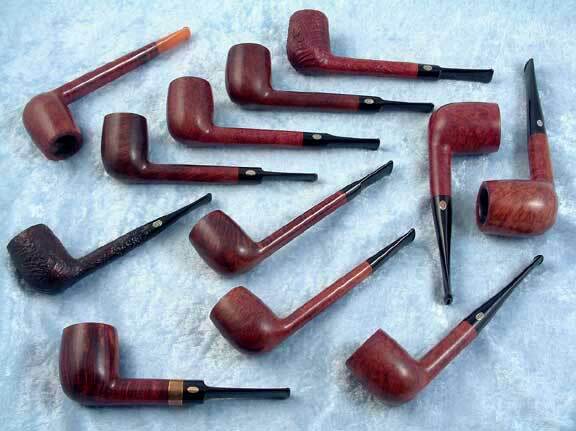 But, they are solid, classic pipes with a long history, and they can be subtly and sublimely beautiful. They can also often be had without sacrificing too much coin. Here, in this sea of GBDs, are some of my silver mounted pieces, all dating between 1919 and the 1950s. They're pictured with a beautiful amethyst glass ashtray bearing a 1925 patent date. The New Standard full-bent is a fascinating Hungarian derivative from 1954. The amber stemmed Speciale billiard is interesting in that it bears no country of origin stamping, nor any hallmarks on the silver, though the stemwork is typical of early 20th century pipes. Billiards and derivatives. The gold banded Pedigree in the front is as beautifully grained as any I've seen. At the top is an uncommon brown Prehistoric, with an exceptional blast. 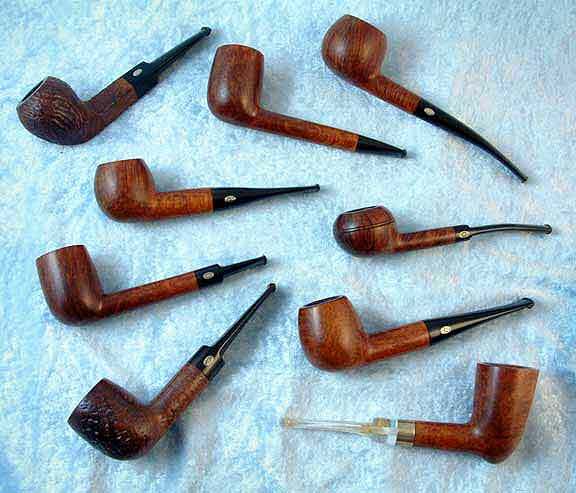 The two pipes at the right are shape #135, the largest of the standard billiard shapes. Squat bulldogs, including an unsmoked 1950 saddle version. One of these days, I'll break it in! The top pipe is a French-made New Era. Rhodesians! 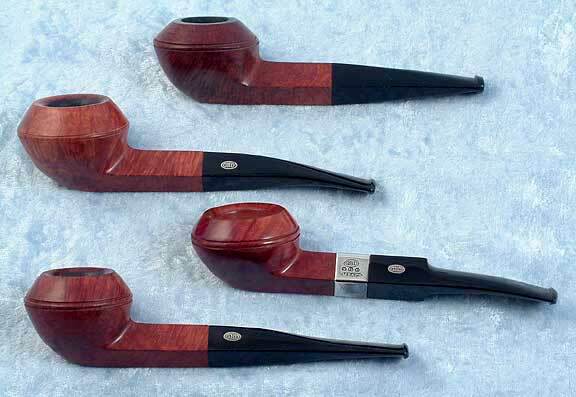 This is probably my favorite of all pipes shapes, and GBD always did an exquisite job executing it. The saddle version (#9438) is far more common than the taper (#9242). 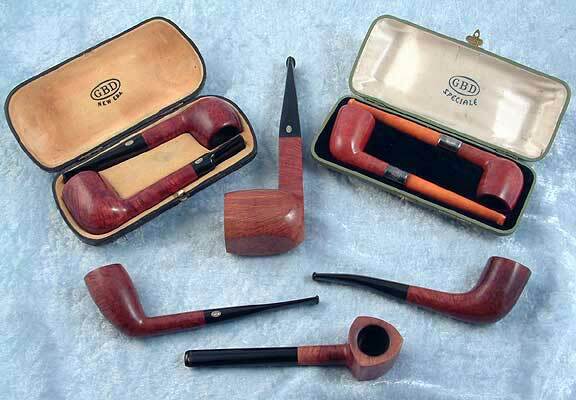 The pipe in the upper right is a French-made Speciale Standard, and has an interesting, slightly longer tapered shank, rather than the more common short cylindrical one shown in the other pieces. Pots and long shank pots - or wide bowled lovats. This is surprisingly one of my favorite shapes for smoking Virginia flakes. The long-shank (#9493) variation offsets the more traditional stubbiness of most pot shapes. The square shank in the foreground is an interesting “Collector” variation in the Granitan finish,with quite a large bore. The Granitan finish was first sandblasted, then polished, leaving a sort of smoothly worn, rock-like surface. The company sought to achieve the lightness of a sandblast, while allowing the grain to show as well. It took me a while to warm up to it, but it's really nice on the right pipe. The piece on the left is an example of the unusual “DuraMount”. The solid aluminum block at the shank's end protects the shank from splitting if the pipe is dropped. Interesting shapes! One of the reasons I was originally attracted to GBDs was their innovation with shapes. These are some of my faves. A note about Perspex stems: Perspex was originally patented in Canada in 1934. It didn't take long for GBD to begin using it as a stem material; the earliest example I've been able to date has a 1937 hallmark. These can generally be cleaned with alcohol, though I've seen several cases where the acrylic has crazed from this treatment, so caution is advised, and even when thoughoughly cleaned, some staining can remain. But, when polished up, these things shine like diamonds. The pipe at the bottom center, a Pedigree acorn, is shape #9560, something that had eluded me until a question arrived in my inbox from someone who has the same shape. The stamping on mine is all but invisible, so I hadn't been able to read the shape number. It's not a common shape, but is certainly a lovely one. A couple of old cased sets, and some other interesting pieces. 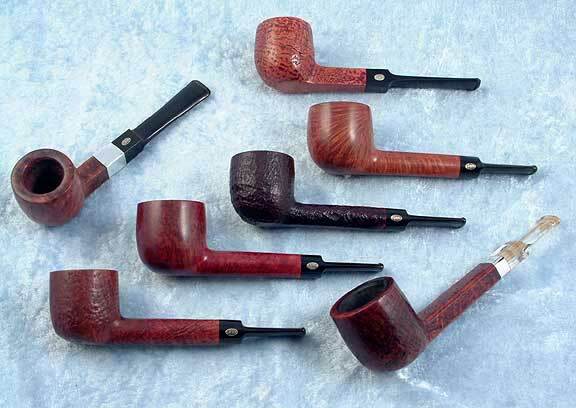 The panel billiard is an ODA+ sized Virgin with a meerschaum lining. The grain is exceptional, and it's a fantastic smoker. The cutty may look familiar to those who enjoy my Classic Collection blends. The cased pair of New Era pipes is in beautiful condition, dating to sometime in the 1960s. The pair of amber stemmed Speciales are London-made, in pristine condition (the dublin is unsmoked), and date to 1931. A few miscellaneous pieces, including a couple very nice Virgin apples, a Virgin lovat with exceptional grain. Check out the whimsical little bullcap. At the upper left is an Edenroc bulldog, made in France. The rustication is a fascinating attempt to replicate a craggy sandblast. Nice job, too! A recently acquired New Standard in my favorite bent rhodesian (#9242) shape. This is an old piece, and is the first GBD I've seen with plumbing in it. The pipe was beat to death when I got it, and the restoration took quite a while, but the results were worth the time. Shown are a pair of Originales. These pipes were made in the Paris factory, which closed in 1952. 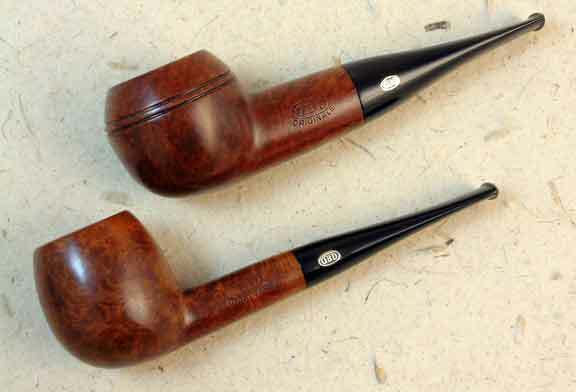 They were reportedly produced from very old briar, and seem to be quite scarce, as these are the only two examples I've been able to acquire. Both are wonderful smokers. In the foreground is a very unusual GBD New Era bulldog. The rondelle and the stamping are both on the top of the rounded diamond shank. 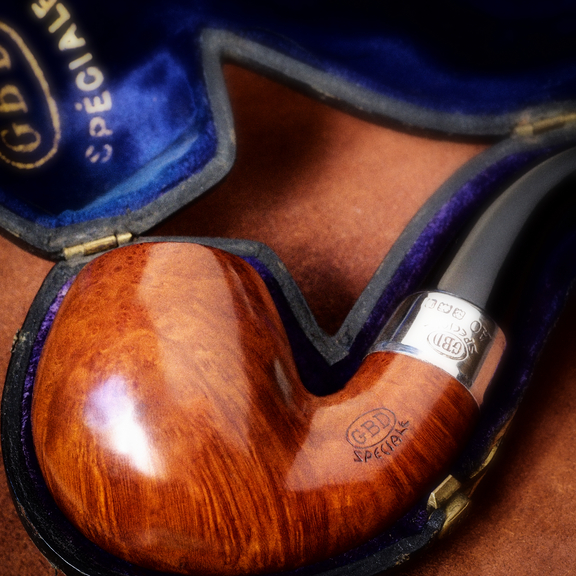 This pipe had belonged to the late Terry Hagley, a fellow GBD enthusiast. His brother Mike was kind enough to offer this pipe to me at the Ricmond CORPS show in 2004. 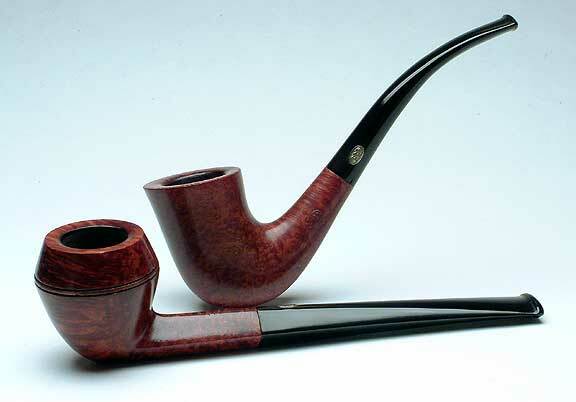 The background pipe is a delightful French-made Speciale in shape 109, a tiny calabash shape. The birdseyes on this piece are spectacular - far more engaging than a web photo can depict! A huge, French made GBD sandblast billiard, shown with a more diminutive New Era apple that was given to me by my pal Brian at the 2005 CORPS show. The apple is about a group 3 size, and the billiard is somewhere between an ODA and a true magnum size. It's nearly 3“ tall, and about 6.5” long, with a lovely blast. A great smoker, too! This pipe has been in my collection for some time, but is only now photographed and presented here. When I got it, it was quite a mess, but it restored beautifully, and is a wonderful, rare shape, especially with the case. It's a French made New Era, with a graceful bend and an oval shank. I've only seen one other like it. This gorgeous Spéciale from 1910 was well protected by its case, which has seen better days. 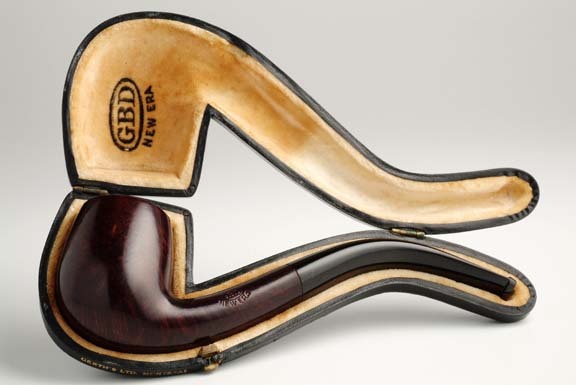 The pipe, though, is wonderful, an exquisite example of old style shaping, and a fabulous smoker. All Content Copyright © 2012, 2013 - G. L. Pease. All Rights Reserved. Use of images or text without express permission is prohibited.